Mechanical properties of live cells in 2D culture. We track the motions of fluorescently tagged peroxisomes in live cells, specifically normal, tumorigenic and metastic human breast cells, in 2D culture. From the tracks, we extract intracellular mechanical properties such as the elastic and viscous shear moduli of the cytoplasm. These moduli play a role in the dynamics of cell deformation, which occurs during metastasis. Variational Bayes analysis of particle tracks. A long-standing difficulty afflicting the analysis of particle tracks is their start-stop nature. We’re developing a hidden Markov, variational Bayes, Gaussian mixture model analysis method which can objectively separate tracks into 2 or more states characterized by whether the vesicle is motor-driven or obeys the laws of diffusion. Durotaxis and mechanical properties of live cells grown in 3D culture.Together with graduate student Amanda Smelser, we are growing cells within collagen gels which are crosslinked by photogenerated free radicals. 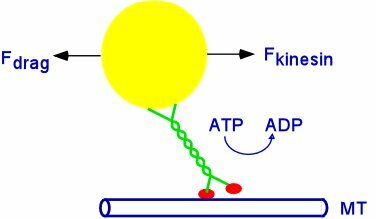 Using an optical mask, gels with a spatial varying elastic modulus in a physiologically useful range can be generated..
Kinesin-microtoubule interactions during gliding assays under a uniform magnetic force (Todd Fallesen). We attached superparamagnetic beads to the +ends of microtubules, then carried out upside-down motility assays between the polepieces of a novel electromagnet which applied a uniform force to the beads. We were able to measure the number of motors pulling a microtubule. We were also able to dependence of microtubule velocity on the number of attached motors. Our conclusion that vesicle velocity in vivo increases with an increasing number of active motors is still controversial; the conventional view is that for processive motors, such as kinesin, the number of motors does not change the speed. To bolster our view, we are determining force-velocity curves for 2, 3, and 4 full-length dimeric kinesin motors during gliding and bead assays in vitro. One of the most widely used methods for observing live cells is differential interference contrast light microscopy. To further improve contrast and thus to better observe small vesicles, one can subtract a background image from the DIC images. Our lab has developed software which continuously updates this background image and displays the background-subtracted image to the microscopist in real time. We do this by constructing the background image from an average of the most recent 8 frames. Non-moving objects disappear in the backgrouond-subtracted image, so the contrast of moving objects such as vesicles can be aggressively enhanced. Our method takes full advantage of the full grayscale of the superior grayscale information available with 12-bit, scientifiic-grade CCD cameras. We are continuing to improve upon this powerful technique. A flow-chart of the software is provided under RESEARCH. A second way to improve differential interference contrast light microscopy is to modulating the offset retardance between + G and -G with a fast, computer-controllable liquid-crystal retardation modulator. Such modulators are easily inserted into a standard microscope. Switching G in alternate frames switches image highlights into shadows and vice versa. By subtracting alternate images(0-1, 2-1, 2-3, 4-3, 4-5, 6-5...) with an image-processing board, the pm-dic difference images are displayed in "real time", with background automatically subtracted and contrast improved by a factor of two. Because pmdic is a difference method, one can use a modern 12-bit cooled digital CCD cameras to produce images with very flat background, low noise, and excellent spatial resolution. [More details about PM-DIC]. Project 1: Molecular motors are proteins which do mechanical work in cells. They are the locomotives of the cell's transportation system; the tracks are actin fibers or microtubule and; the fuel is ATP. For example, molecular motors are key players in the separation of chromosomes during cell division. They also transport vesicles at velocities of about 1 micrometer/s within cells. We are optical microscopic imaging to determine the velocity of a motor or its load in cells or in solution. We're using magnetic beads or viscous drag to slow the motors down. If you're interested in doing 2-5 hours/week of research in this area, send me email. With a little luck, your undergrad research will lead to a publication. Project 2. Tracking objects like microtobules or motor proteins in cells is a challenge. Currently, we can track these objects by attaching a fluorescent tag to them and collecting movies with a video microscope. This project would involve preparing fluorescent microtubules or kinesin and measuring the location of the fluorescent moleculat. Currently, our best precision is +/- 30 nm, about 1/10th the wavelength of light, . If you're interested in how this is done and improving it further, send me an email. Undergraduate students: are you interested in both physics and biology? Check out the Wake Forest Concentration in Biophysics and Biochemistry. The Concentration in Biophysics and Biochemistry allows you to obtain a BA in Physics or a BA in Chemistry, with a core set of biophysics and biochemistry courses that provide a rigorous and quantitative training, while maintaining a specific focus on the biosciences. By following the outlined Track courses, you will obtain a knowledge-base that makes you highly qualified to pursue research careers in the biotechnology industry or graduate research and education in biochemistry, biophysics, or the pharmaceutical sciences. You would also be prepared for a number of non-science careers, such as those in secondary education, business, or law. With strong biochemistry and biophysics research programs in the Physics and Chemistry Departments, Wake Forest is uniquely poised to offer this integrated and comprehensive track, with a diverse offering of undergraduate research opportunities. Graduate students: are you interested in interdisciplinary studies in biophysics and structural biology? Check out the Structural and Computational Biophysics (SCB) Graduate Track at WFU. This Track offers students the opportunity to obtain advanced degrees (Ph.D. or M.S.) in a traditional discipline (Physics, Chemistry, Biochemistry & Molecular Biology, or Computer Science), while receiving broad training in the interdisciplinary field of Structural and Computational Biophysics. Track faculty represent all four disciplines and include additional affiliated faculty from Biology and Biomedical Engineering.